Thankfully HE finally has an appointment! It’s taken many phone calls back and forth with our new male client, the clinic where he was seen and the imaging center where he’ll receive his mammogram and ultrasound, but we’re all relieved he’s finally getting the help he needs. Hopefully the tests will be able to rule out breast cancer. Yes, men can and do get breast cancer. 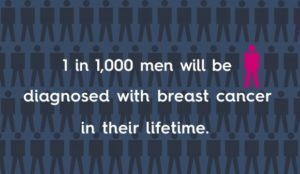 According to the American Cancer Society, about 1 in every 1,000 men will be diagnosed with breast cancer in their lifetime. 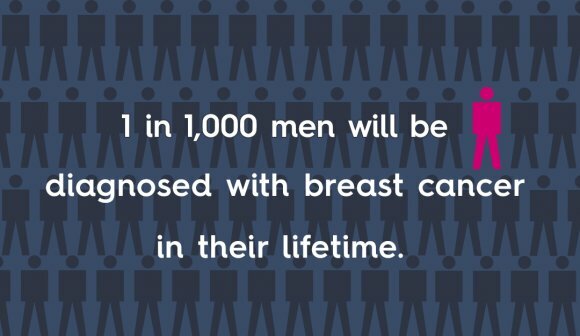 While this statistic may not be as daunting as 1 in 8 women, the fact that breast cancer is so rare in men, makes diagnosing it all the more challenging. Because breast cancer is “a woman’s disease,” men may be diagnosed at a later stage, lowering their survival rate. The American Cancer Society stresses that men need to not only be aware that they can get breast cancer, but they also have to be proactive about the disease and reporting any lumps or inflammation to their doctor. The most common sign of breast cancer in men is a painless lump or thickening in the breast or chest area. Men with symptoms receive the same screenings and diagnostic tests that women receive, including mammograms, breast ultrasounds and breast biopsies. As with women, Albie Aware provides direct services for men who need help receiving a doctor’s referral for testing, paying for testing, obtaining second opinions, and receiving resources and advocacy for finding or fighting breast cancer. If you or someone you know needs help, call Albie Aware at 916-927-1592. Are You At Risk For Lymphedema?